The Shed at Tanglewood; photo by John Ferrilo. Every summer Saturday, an enthusiastic audience gathers at Tanglewood at 9:30 in the morning, ready to learn about the program for the Sunday afternoon concert. 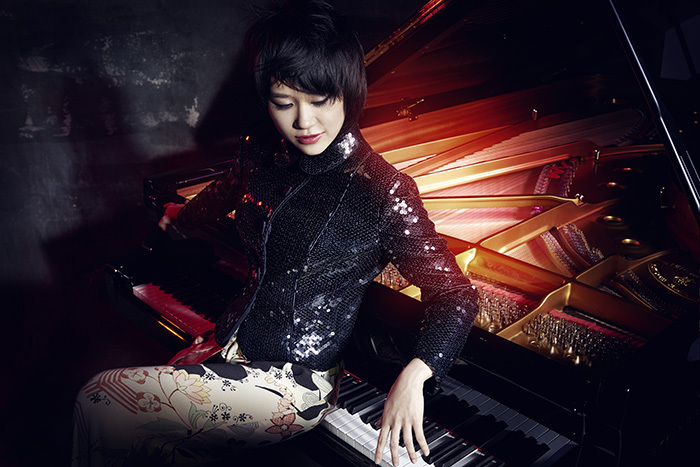 On Saturday, July 16, they were rewarded with a wealth of interesting information about the connections between George Gershwin’s “Rhapsody in Blue” and Maurice Ravel’s Piano Concerto in G, two magnificent works set to be performed by pianist Yuja Wang the next day. Robert Kirzinger, BSO Assistant Director of Program Publications, gave the talk at 9:30, followed at 10:30 by the rehearsal of the Sunday program with the Boston Symphony Orchestra (BSO) under the direction of conductor Gustavo Gimeno. Pianist Yuja Wang; photo by Norbert Kniat. Gimeno led the BSO through the complete program for the Sunday, July 17 concert, beginning with the two pieces that featured Yuja Wang at the piano — the Ravel and the Gershwin — followed by Sergei Prokofiev’s Symphony No. 1 in D and Igor Stravinsky’s Suite from “The Firebird.” It’s fascinating to observe the musicians in rehearsal, especially when the conductor stops and returns to certain passages to refine the performance. 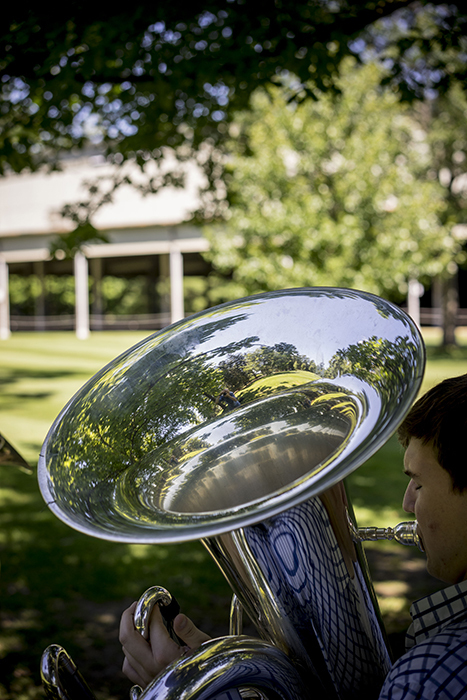 The weekly Saturday morning line-up at Tanglewood, with the pre-rehearsal talk at 9:30 a.m. and the open rehearsal at 10:30 a.m., offers an exceptional opportunity to enjoy the music and the orchestra in a more casual setting; expand one’s knowledge of classical music; and to prepare for the next day’s concert – this writer found that having background information and a deeper understanding of the composers and their work made the Sunday concert much more enjoyable and more meaningful. The Shed at Tanglewood; photo by Marco Borggreve. Marc Mandel, BSO Director of Program Publications, delivers many of the Saturday morning talks. He will be covering Mahler on August 6, and the following week will be speaking about the Schumann Fourth Symphony; Kirzinger calls Mandel a Schumann aficionado. Saturday morning rehearsals of the BSO are open to the public, with reserved-seat Shed tickets available for $33 (front and boxes) and $23 (rear), and $13 (lawn). Rehearsals begin at 10:30 a.m. The half-hour pre-rehearsal talk is offered free to all rehearsal ticket holders beginning at 9:30 a.m. in the Shed. Marc Mandel, BSO Director of Program Publications, will speak August 6, and August 13. Robert Kirzinger, BSO Assistant Director of Program Publications, will speak August 20 and August 27. Composer/educator Gerard McBurney will be the guest speaker July 30. For more information, visit tanglewood.org. 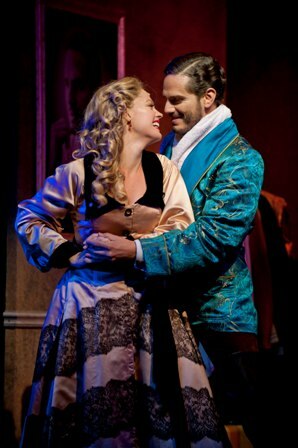 Elizabeth Stanley and Paul Anthony Stewart in Kiss Me, Kate, at Barrington Stage Company. Photo by Kevin Sprague. 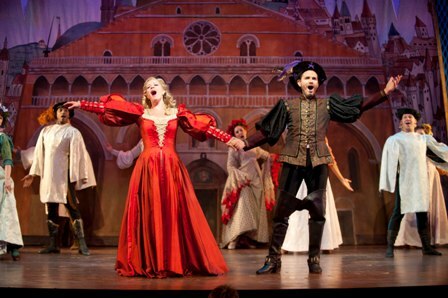 Elizabeth Stanley in Kiss Me, Kate at Barrington Stage Company. Photo by Kevin Sprague. “Another Op’nin’, Another Show,” the first crackerjack production number in Kiss Me, Kate, takes us to a theater in Baltimore circa 1948, where backstage is abuzz with actors and dancers arriving, racks of costumes being rolled into place, and clipboards being checked. With spectacular dancing and superb vocal performances, it’s a dazzling beginning for Cole Porter’s most successful musical. This Barrington Stage Company (BSC) production is joyful, jubilant theatrical magic from the opening number to the final bow. 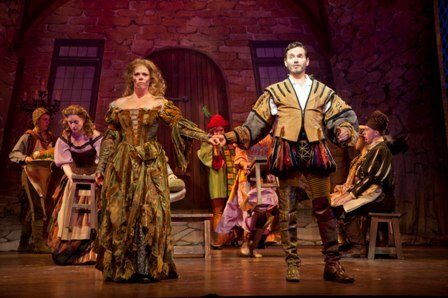 Elizabeth Stanley and Paul Anthony Stewart in Kiss Me, Kate at Barrington Stage Company. Photo by Kevin Sprague. impresario, leading a company of performers in an exuberant musical version of Shakespeare’s “The Taming of the Shrew.” He plays Petruchio and has cast his ex-wife, Lilli Vanessi (a magnificent performance by Elizabeth Stanley), as his leading lady, Kate, even though their divorce is hardly amicable. Their highly dramatic sparring and bickering (in spite of the obvious fact that they still love each other) is the source of much of the humor and conflict in the plot, when they are portraying Petruchio and Kate as well as when they are the actors Fred and Lilli. Their voices sound magnificent together, making their duets outstanding. Mara Davi and Tyler Hanes in Kiss Me, Kate at Barrington Stage Company. Photo by Kevin Sprague. luminous as the actress Lois Lane, who plays Bianca in “Shrew,” well-matched with Tyler Hanes as Bill Calhoun, cast as Lucentio. Her rendition of “Why Can’t You Behave” is compelling – and the couple make a fabulous pair in their dance numbers as well. Carlos Lopez and Michael Dean Morgan are hilarious as Damon Runyon-style gangsters who arrive backstage, intent on collecting a gambling IOU. They end up slamming across a wickedly funny rendition of “Brush Up Your Shakespeare,” Porter’s tips on using the Bard to woo their lady friends. Carlos Lopez and Michael Dean Morgan in Kiss Me, Kate at Barrington Stage Company. Photo by Kevin Sprague. 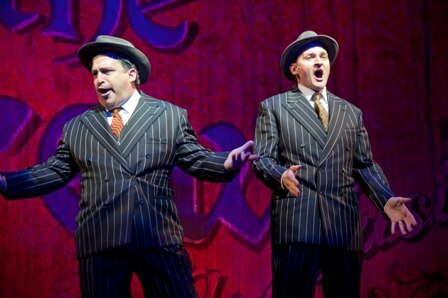 Joe Calarco has created a beautifully balanced production, highlighting the bawdy nature of a lot of the jokes, the witty Cole Porter lyrics, and the inherent humor of Shakespeare’s “Taming of the Shrew,” transformed into a musical within a musical. Darren R. Cohen, the music director, leads a large and accomplished orchestra, which fills the theater with the lush music – and everyone in the cast sings so well. It’s a pleasure to hear these terrific Cole Porter songs performed so magnificently. From the torch song “Why Can’t You Behave,” to the soaring ballad ‘Wunderbar,” to the hilarious “ I Hate Men,” every song is memorable. The cast of Kiss Me, Kate at Barrington Stage Company. Photo by Kevin Sprague. The second act begins in the alley behind the theater, where the actors and crew are taking a break during intermission. Paul, played superbly by Matthew Bauman, sings the Cole Porter classic “Too Darn Hot” with a fresh, smart approach matched by terrific choreography performed by Bauman and the whole company. The sizzling dance moves are breathtaking; Lorin Latarro has created dances that work beautifully for the 1948 setting of the show and feel modern and fresh at the same time. Audiences at Barrington Stage Company have come to expect musicals with accomplished casts and superb production values. This summer, the BSC team has done it again, presenting a spectacular Kiss Me, Katethat is entertaining and engaging in every way. For more information, call the Barrington Stage Box Office at 413-236-8888 (or toll-free at 855-TIX-2BSC) or visit www.barringtonstageco.org. Jonathan Croy, Jennie M. Jadow, Sarah Jeanette Taylor, and David Joseph in It's A Wonderful Life. Photo by Kevin Sprague courtesy Shakespeare & Co.
Front, Sarah Jeanette Taylor and David Joseph and back, Jennie M. Jadow and Jonathan Croy in It's A Wonderful Life. 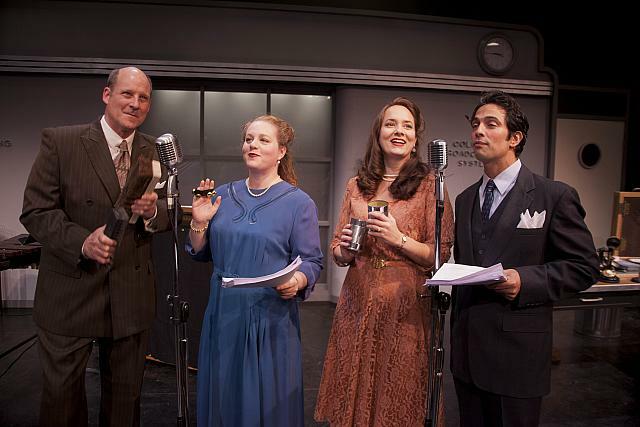 Photo by Kevin Sprague courtesy Shakespeare & Co.
It’s a Wonderful Life: A Live Radio Play is utterly charming, a rendition of the familiar film story delivered with heart and humor and no small amount of skill. The cast of five seamlessly portrays about 50 characters, from a curmudgeonly miser to a guardian angel to a snarky New Yorker, without costume changes and without a moment of confusion for the audience. And as happens so often at Shakespeare & Company when the cast includes long-time company members, they make it look effortless. The show is set in a New York City broadcasting studio on Christmas Eve in 1946. Every detail is spot-on, from the APPLAUSE signs that light up to the authentic microphones, a xylophone and a piano, and two tables of unusual objects used to create the sound effects. The audience meets the cast of The Jack Halloway Show as they prepare to perform the “Fireside Family Christmas” with holiday music and the Jack Halloway Players’ presentation of It’s a Wonderful Life on the radio. The actors, in character as the 1940s radio personalities, mingle and mill about on the stage, greeting the audience and sorting out their scripts. A minor crisis ensues when the sound effects man can’t make it to the studio, but the actors quickly divide up the sound cues and the show begins. 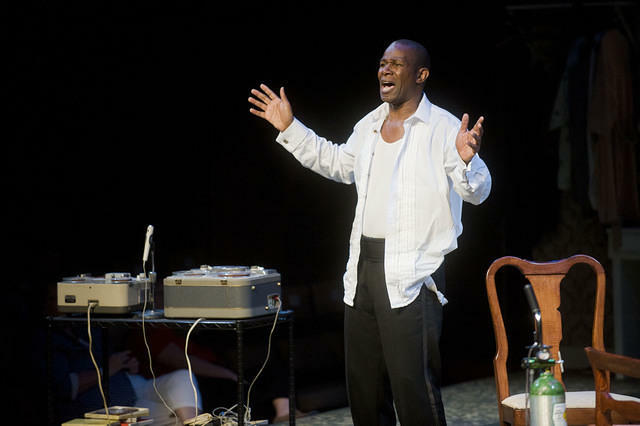 David Joseph delivers a stellar performance as Jack Halloway, a smooth and sophisticated star of the airwaves, who plays the role of the earnest George Bailey in the radio play. He starts the “broadcast” with a rendition of “The Christmas Song” followed by applause from the audience as prompted by the flashing signs, just one of several songs interspersed through the evening. Once they start acting It’s a Wonderful Life, the actors do a marvelous job of recreating the familiar film storyline: George Bailey is despondent over a business failure and Clarence Oddbody, his guardian angel, arrives on assignment from heaven to help George realize that he is not a failure, but has actually had a wonderful life. Director Jenna Ware gives the audience a very special experience – the sentimental story of George Bailey and the residents of Bedford Falls, with all their triumphs and tribulations, is portrayed with warmth and authenticity, but at the same time, we have all the fun of a wonderful behind-the-scenes look at the actors broadcasting a radio show with the creation of the sound effects an entertaining, often humorous, bonus. The superb direction and the expertise of the cast are apparent at every moment – and the telling of the story of It’s a Wonderful Life is every bit as heart-tugging as the classic movie version, enhanced by the added dimension of the 1940s radio performers having to change character, play the music, add the sound effects, and even deliver commercial announcements. It’s an extraordinary evening of theater without doubt. David Joseph gives an excellent performance, playing radio host Jack Halloway who stars as George Bailey in the drama – skillfully giving us an earnest, well-intentioned George Bailey who is quite different from Joseph’s 1940s radio persona. Sarah Jeanette Taylor is a charming counterpart to David Joseph, playing radio star Sally Applewhite and Mary Hatch Bailey in the play-within-a-play, imbuing Mary with just the right sweetness and spirit. As radio actor Lionel Harrison, Jonathan Croy looks like he stepped right out of the 1940s. But once he starts assuming the roles of Joseph the narrator, Mr. Gower, Uncle Billy, Mr. Potter, Ernie, Nick, and many more characters, he is extraordinary in the ease with which he slides from one to the next, from angelic voice of reason to curmudgeonly miser to addled elder to a small boy. It’s an impressive and effective set of performances. The same can be said of the very talented Ryan Winkles, who plays radio star Harry “Jazzbo” Heywood as well as Clarence the guardian angel, Harry Bailey, Sam Wainwright, and more. Jennie M. Jadow gives us all the female characters, from little Zuzu to Violet, the town hussy, imbuing each with a spirit and charm – Jadow is particularly good at creating wonderful, expressive voices for the various characters. It’s a Wonderful Life, indeed, at Shakespeare & Company, with this very successful holiday offering. It’s a delight from beginning to end. Ted Koch and Joey Collins in Scott and Hem in the Garden of Allah. 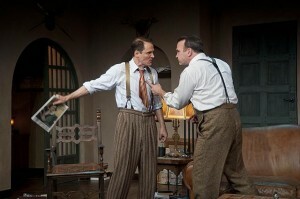 Photo by Kevin Sprague, courtesy Barrington Stage Co.
Joey Collins and Ted Koch in Scott and Hem in the Garden of Allah. 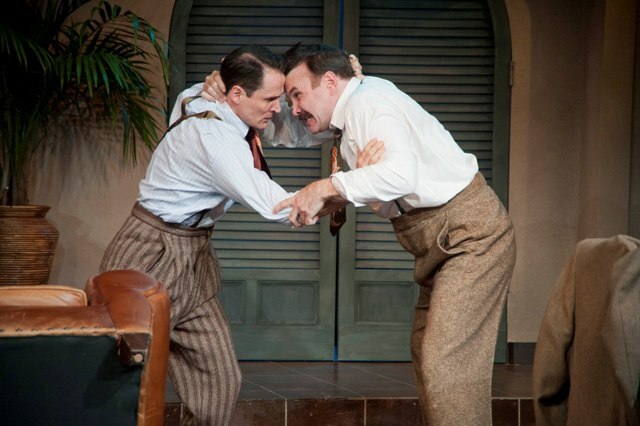 Photo by Kevin Sprague, courtesy Barrington Stage Co.
of literature; bringing them together in a volatile situation; and then setting off the pyrotechnics in a rollicking, freewheeling encounter. 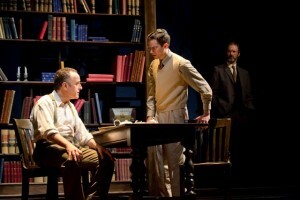 F. Scott Fitzgerald and Ernest Hemingway were two of the most influential and enduring writers of the 20th century, and as portrayed in St. Germain’s riveting new play, possibly two of the most tortured. Scott and Hem in the Garden of Allah offers an insider’s view of what happens when two successful and acclaimed novelists attempt to transform their literary successes into popular films. Joey Collins is excellent as a resolute but wavering F. Scott Fitzgerald, making an enormous effort to stay sober and produce a film script that will earn enough money to support his wife Zelda at the mental hospital. Ted Koch is equally good as a blustering, bombastic Ernest Hemingway, drinking liberally to escape from his own demons. The two actors, skillfully directed by St. Germain, are compelling, authentic, and completely engaging, struggling with success, celebrity, alcohol, and the ever-present possibility of failure. 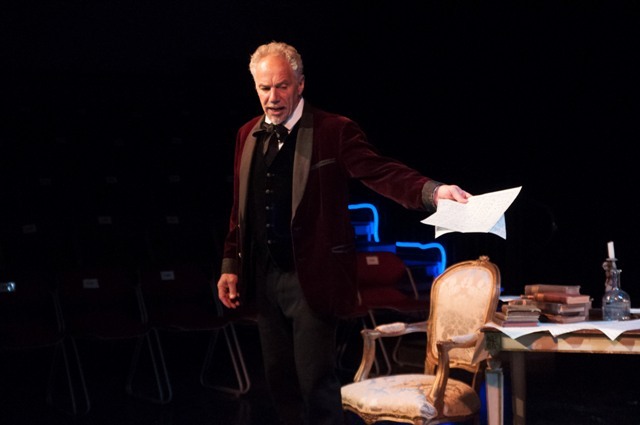 The Garden of Allah was a cluster of apartments in West Hollywood, and in this riveting new play, St. Germain has chosen it as the site of his imagined meeting between F. Scott Fitzgerald and Ernest Hemingway. It’s 1937 and Fitzgerald is under contract to the movie studio, churning out a script under a ridiculously tight deadline. Angela Pierce gives a brilliant performance as the brittle, business-like, and extremely focused Evelyn Montaigne, Louis B. Mayer’s snarky assistant who has been charged with making sure Fitzgerald delivers the screenplay on time. Joey Collins in Scott and Hem in the Garden of Allah. Photo by Kevin Sprague, courtesy Barrington Stage Co.
Collins shows us the anxiety-ridden Fitzgerald grappling with writer’s block as well as guilt over having had Zelda committed. When the play begins, he is trying his best to fulfill his commitment to the movie studio, his financial obligations weighing heavily on him. And then Hemingway shows up, also in the midst of business deals with the movie industry, to work the angles and achieve his own agenda. The writing is their common ground; otherwise, the two were very different. Fitzgerald is struggling, so much so that he says, “Writing is the enemy.” Hemingway is all ego, larger than life, but at the same time, highly sensitive to any criticism. Fitzgerald and Hemingway banter, bicker, reminisce, and argue, and the audience has the privilege of listening in as the two giants interact. While it is true that these two knew each other in real life, St. Germaine has created the encounter that makes up this 90-minute play. 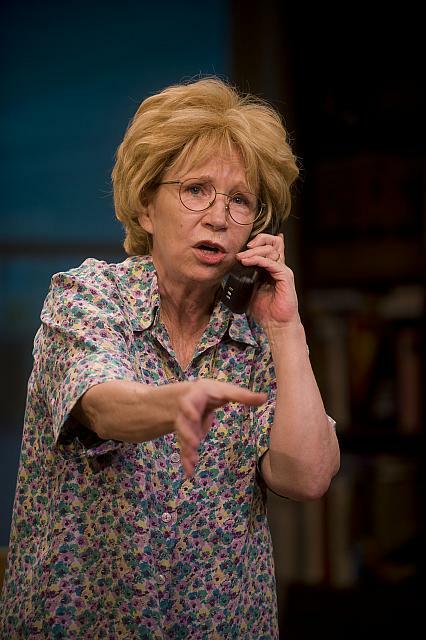 St. Germaine has had great success portraying well-known figures in his well-crafted, tightly written plays – notably Dr. Ruth Westheimer in Becoming Dr. Ruth and Sigmund Freud and C.S. Lewis in Freud’s Last Session – and now he adds Scott and Hem in the Garden of Allah to the roster. The production is meticulous in every way, from the crisp dialogue, and the accomplished cast to the work of the design team: David M. Barber delivers a marvelously detailed 1937 apartment; Margaret A. McKowen designed accurate and evocative costumes, and Scott Pinkney created lighting that added atmosphere and definition. Scott and Hem in the Garden of Allah is a smart, scintillating evening of rivalry, angst, and humor, as well as insight into the world of working writers. 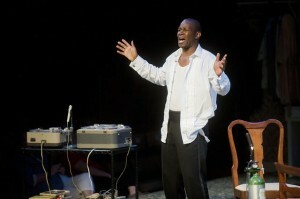 For information visit www.barringtonstageco.org; for tickets, call 413-236-8888. 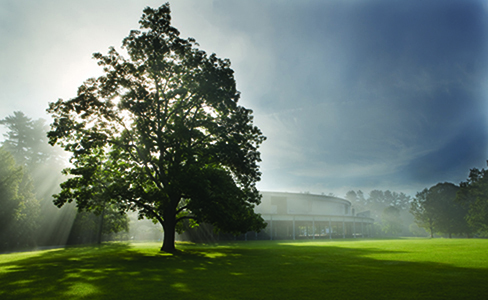 Christoph von Dohnanyi, Emanuel Ax, and the Tanglewood Music Center Orchestra. Photo by Hilary Scott, courtesy Boston Symphony Orchestra. Mozart and Mahler were performed with panache and passion last Sunday when the Tanglewood Music Center Orchestra, led by Christoph von Dohnanyi, took the stage in the Koussevitsky Music Shed and delivered magnificent performances of these major works in its final performance of the summer season. And while it is quite possible to write about a concert at Tanglewood without mentioning the weather, Sunday was a most perfect day, sunny but not too warm, making the afternoon concert especially delightful. Acclaimed pianist Emanuel Ax joined the TMC Orchestra in performing Mozart’s Piano Concerto No. 9 in E-flat. The concerto is a magnificent piece that is very Mozart-like; it is immediately recognizable, most pleasantly so. Ax’s meticulous, beautifully dynamic playing was supported by the orchestra offering rich and lustrous amplification of the motifs played on the piano. After the intermission, von Dohnanyi led the orchestra in a vibrant, expressive, and moving performance of Gustav Mahler’s Symphony No. 1 in D. The orchestra played magnificently, with lively energy, well-defined dynamics, and a sense of excitement. The symphony is one of Mahler’s most accessible works, with magical bird calls woven into the piece, a mystical cuckoo appearing in the first movement, and hunting horns, pastoral passages, fragments of marches and folk music, even a passage that sounds like a minor-key klezmer tune, in the other sections. The music feeds the listener’s imagination, with so much texture, color, and the strong narrative quality — it’s easy to imagine a story unfolding and ending with a blast of triumph. For anyone who may not know, the Tanglewood Music Center Orchestra is made up of extremely talented musicians who are completing their formal training and are participants in the fellowship program at the Music Center. The list of prominent alumni from this distinguished program is long and impressive; it includes such Tanglewood luminaries as Leonard Bernstein, Seiji Ozawa, and the concert’s conductor, Christoph von Dohnanyi. It was a glorious concert – from the idyllic setting and ideal weather to the deeply satisfying orchestral performance, the afternoon could not have been lovelier. All the more reason to venture to Tanglewood before the summer season ends with Beethoven’s Ninth on August 25. For information or tickets, visit www.tanglewood.org. 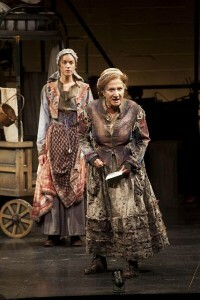 Brooke Parks and Olympia Dukakis in Mother Courage and Her Children. 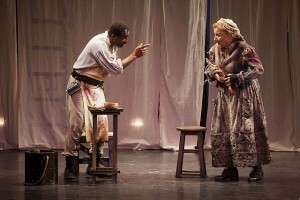 Photo by Kevin Sprague, courtesy Shakespeare & Co.
John Douglas Thompson and Olympia Dukakis in Mother Courage and Her Children. 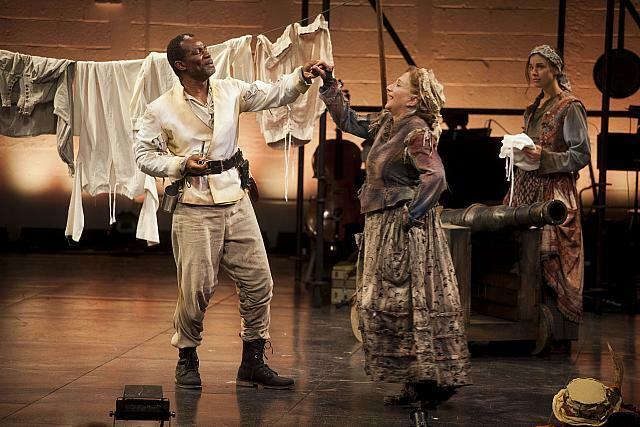 Photo by Kevin Sprague, courtesy Shakespeare & Co.
War, but also represents war in any age, at any time. 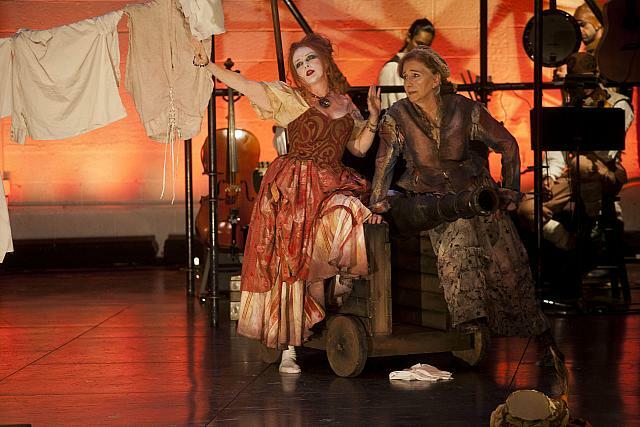 Paula Langton in Mother Courage and Her Children. 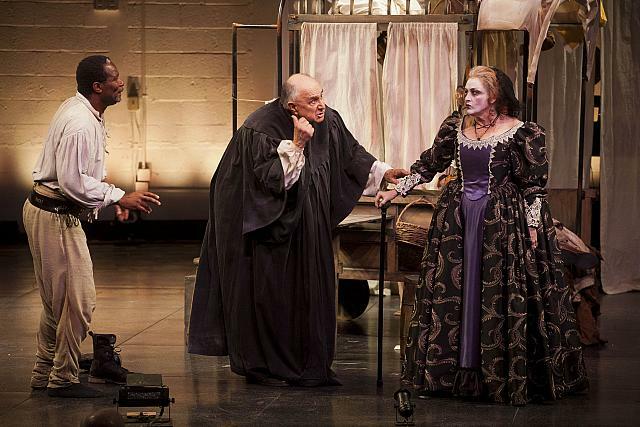 Photo by Kevin Sprague, courtesy Shakespeare & Co.
conflict. She hates the war that ultimately takes all her children, but she needs it, needs the economic environment it provides. Paula Langton and Olympia Dukakis in Mother Courage and Her Children. Photo by Kevin Sprague, courtesy Shakespeare & Co.
understands what she has to do, even after the appalling losses of her children. “I won’t let you spoil my war for me. Destroys the weak, does it? Well, what does peace do for ‘em, huh? War feeds its people better,” says Mother Courage. 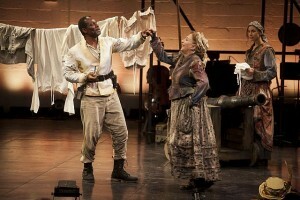 Brooke Parks and Ryan Winkles in Mother Courage and Her Children. 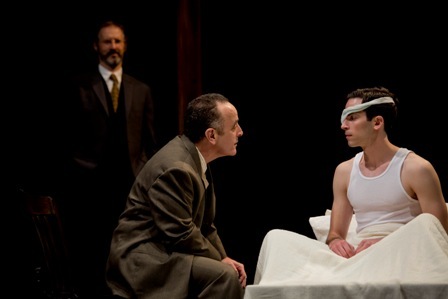 Photo by Kevin Sprague, courtesy Shakespeare & Co.
affecting naivete by Ryan Winkles, ends up a victim of the war as well. Kattrin is magnificently played by Brooke Parks, who delivers a riveting performance without uttering a single intelligible word, from the way she covets the whore’s red boots to her ultimate despair and a final act of extraordinary bravery and sacrifice. person who establishes a tenuous relationship with Mother Courage, and who has no problem switching his vocation from Catholicism to Protestantism and back again depending on the progress of the religious conflict. The other standout in the cast is Paula Langton as Yvette Pottier, the prostitute and camp follower. Langton is a commanding figure, her beauty disguised by stark makeup, her emotional pain hidden by an attitude of disinterest. She, like Mother Courage, is operating in survival mode. 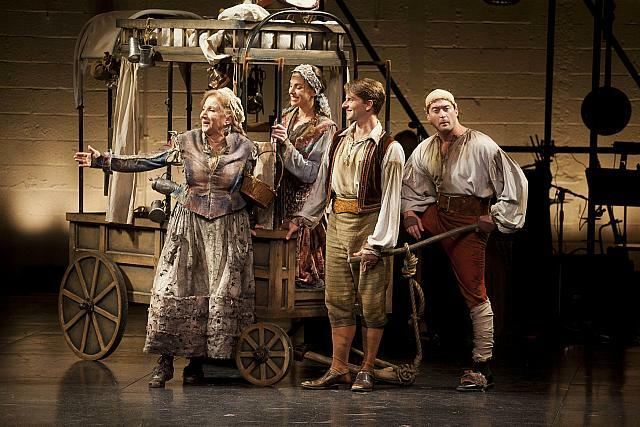 Olympia Dukakis, Brooke Parks, Ryan Winkles, and Josh Aaron McCabe in Mother Courage and Her Children. Photo by Kevin Sprague, courtesy Shakespeare & Co. 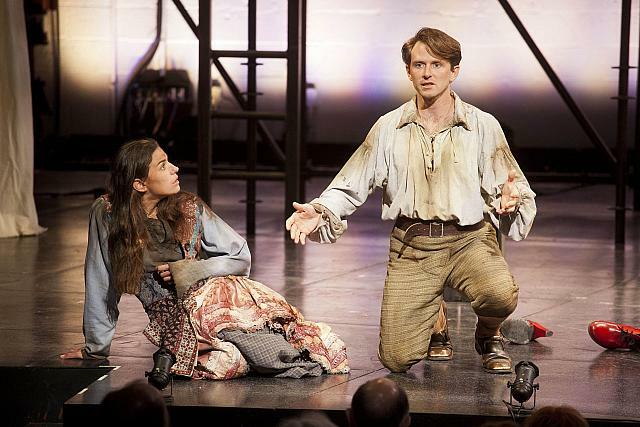 The entire cast is well-balanced; Simotes has created a cohesive, tightly-knit world flavored with tragedy and humor to telegraph Brecht’s urgent anti-war message. The ensemble — Mark Bedard, Charls Sedgwick Hall, Edgar Landa, Nafeesa Monroe, Renée Margaret Speltz, Douglas Seldin, Andy Talen, and Michael F. Toomey – delivers solid performances, many in dual or triple roles. 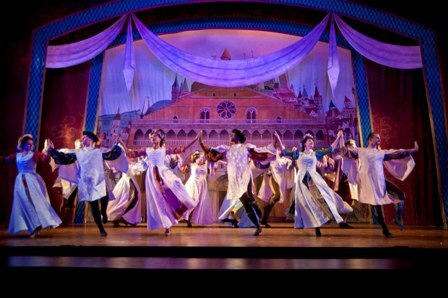 The production team contributed mightily to the success of the production, from the memorable costumes by Arthur Oliver to the set by Patrick Brennan, lighting by Matthew Adelson, and sound by Scott Killian. 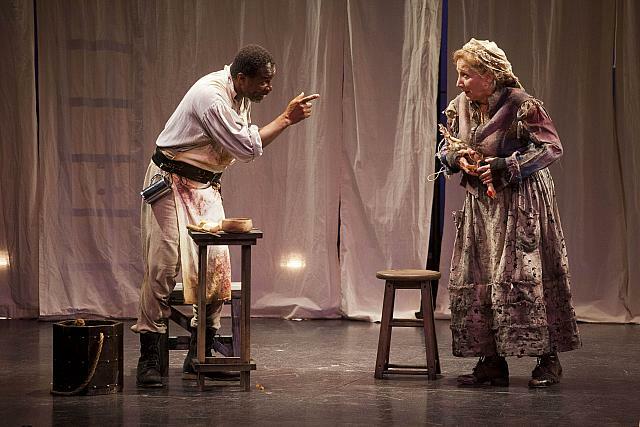 Apollo Dukakis and Paula Langton in Mother Courage and Her Children. Photo by Kevin Sprague, courtesy Shakespeare & Co. This play has been called one of the greatest dramas of the 20th century and in this reviewer’s opinion, this finely crafted production at Shakespeare & Company is one of this summer’s must-see productions. For tickets or more information, visit www.shakepeare.org. Kristine Opolais, soprano, performed at Tanglewood July 27, 2013. [Lenox, MA] – The Tanglewood magic was very much in evidence on Saturday night, when the Boston Symphony Orchestra and the Tanglewood Festival Chorus performed Verdi’s grand, eloquent Requiem Mass with four accomplished soloists. It was disappointing that Andris Nelsons, the BSO’s new music director, could not be there to conduct, but Carlo Montanaro, with an impressive list of accomplishments in the world of opera, did a fine job leading the evening’s program. 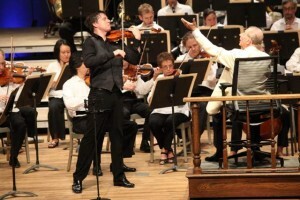 Conductor Carlo Montanaro led the Boston Symphony Orchestra at Tanglewood July 27, 2013. Verdi’s tremendous strength as a composer of opera is on display during the Requiem, which conforms to the formal structure of the mass, but provides the emotional breadth of an operatic work. The Requiem is majestic, with grand gestures and musical theatrics that create an effective and engaging experience for the audience. A full complement of orchestra members was joined on the stage by the ranks of the Tanglewood Festival Chorus, conducted by John Oliver. The chorus members gave an excellent performance, as always, from poignant, quiet passages to moments of explosive passion. This Requiem offers one brilliant passage after another, whether for the chorus, orchestra, or the soloists – it is an immersion in glorious music, especially for the voice. 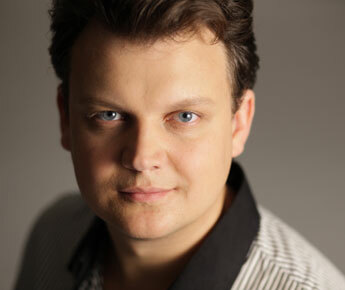 Dmytro Popov, tenor, performed with the Boston Symphony Orchestra at Tanglewood July 27, 2013. The four soloists are tasked with complex singing parts as well as the opportunity to act, and all four acquitted themselves beautifully. Soprano Kristine Opolais is a commanding beauty on stage, gifted with a lush, strong voice and the emotional range to perform this emotional piece with authenticity. Bass-baritone Eric Owens appeared instead of Ferruccio Furlanetto, who was ill, but Owens performed with mastery, power, and nuance. Mezzo-soprano Lioba Braun has a rich, luxurious voice and she delivered some memorable moments. Tenor Dmytro Popov has a magnificent voice, and is a compelling actor as well. 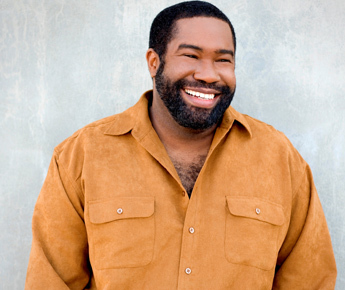 Eric Owens, bass-baritone, performed with the Boston Symphony Orchestra at Tanglewood on July 27, 2013. Photo by Dario Acosta. Verdi has been the focus of several recent films. In Quartet, directed by Dustin Hoffman, one of the characters, a retired opera singer, declares Verdi to be the best composer of music for the voice. In another film, the documentary Defiant Requiem, we learn that during World War II, 150 prisoners at the Terezin Concentration Camp gave 16 performances of the very challenging Requiem, learning it by rote under the most appalling conditions, because the concentration on the music gave them the will to survive. Lioba Braun, mezzo-soprano, performed with the Boston Symphony Orchestra at Tanglewood on July 27, 2013. Verdi’s Requiem is a monumental work, stirring, passionate, pensive, and powerful. This writer believes that in developing an appreciation for classical music, it’s important to be familiar with landmark compositions such as this one, and the opportunity to hear it performed live, and by such illustrious musicians, was not to be missed. It was truly a marvelous evening. 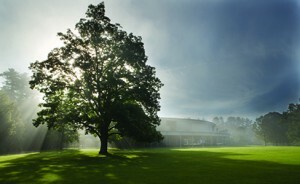 For information on the rest of the Tanglewood season or to order tickets, visit www.tanglewood.org. 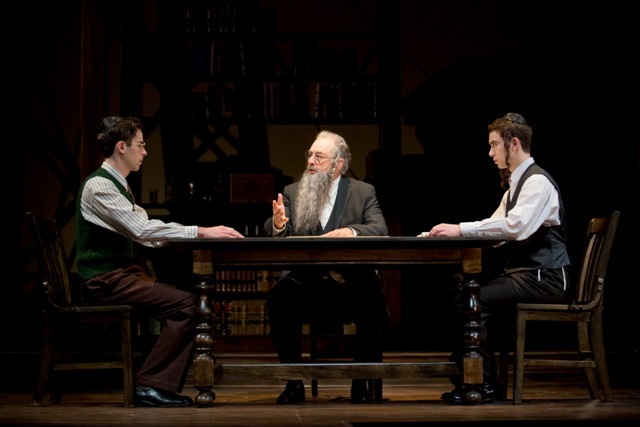 Jeff Cuttler, Richard Topol, Richard Schiff, and Ben Rosenbach in The Chosen. Photo by Scott Barrow. Richard Topol, Adam Heller, and Jeff Cuttler in The Chosen. 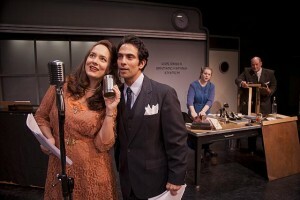 Photo by Scott Barrow, courtesy Barrington Stage Company. engendered by the very different Jewish communities to which they belong, is timely and illuminating in our world of division and conflict. The teenaged Reuven Malter, beautifully played with conviction and passion by Jeff Cuttler, is an observant Jew, living with his widowed father Daniel, a revered scholar and teacher. 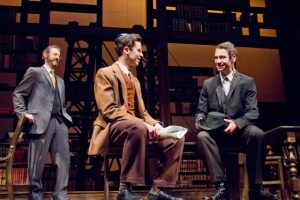 Adam Heller is ideal as Daniel Malter, portraying him with warmth and wisdom. 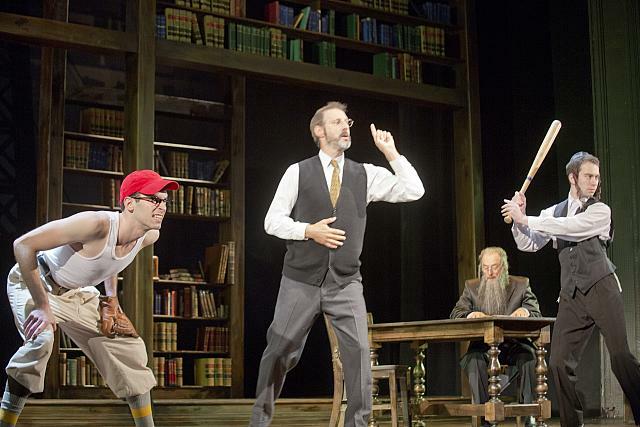 As well as a promising Talmudic student and mathematician, Reuven is a skilled baseball player, and when the play begins, we see him warming up his pitching arm. Adam Heller, Jeff Cuttler, and Richard Topol in The Chosen. 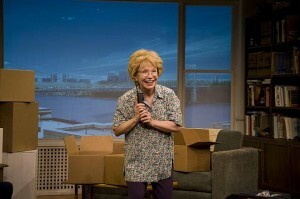 Photo by Scott Barrow, courtesy Barrington Stage Company. Richard Topol plays the adult Reuven Malter, who is our narrator and guide through the world of 1940s Brooklyn, as well as two other characters, and he is perfect as our storyteller, in a carefully calibrated performance full of humor and energy that shifts from explanation and description to his characters and back again. 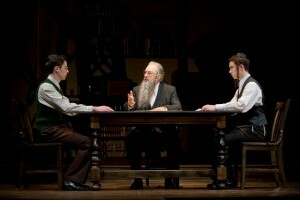 Jeff Cuttler, Richard Schiff, and Ben Rosenbach in The Chosen. Photo by Scott Barrow, courtesy Barrington Stage Company. community; Schiff’s performance is authentic, imposing, compelling, and memorable. Daniel is expected to succeed his father as the rebbe, but he is very conflicted about his future. The friendship between the two boys begins as they stare at each other across the baseball diamond, their rivalry rooted in the different kinds of Judaism that they practice. 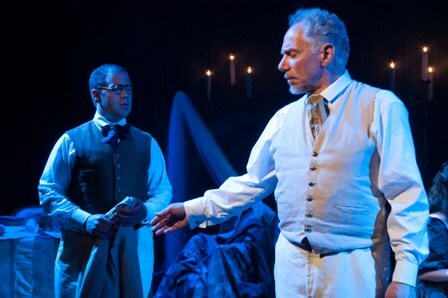 But they have much in common, and their friendship allows the playwright to examine the two very different ways the fathers choose to parent their sons. Richard Topol, Jeff Cuttler, and Ben Rosenbach in The Chosen. 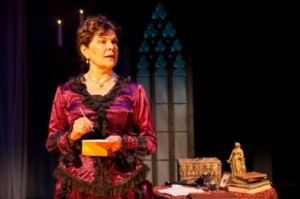 Photo by Scott Barrow, courtesy Barrington Stage Company. We follow the two boys as they grow out of their teen years and enter college; at the same time the Second World War comes to a close and the immense destruction of the Holocaust becomes known, a time period of terrible suffering for the Jewish community. The two actors who play the young friends, and the actors who portray their fathers, make up a perfectly balanced quartet, bringing Potok’s wise and insightful story to full realization. 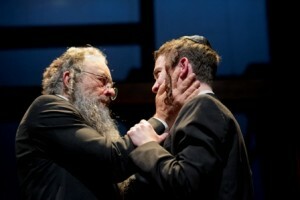 Richard Schiff and Ben Rosenbach in The Chosen. 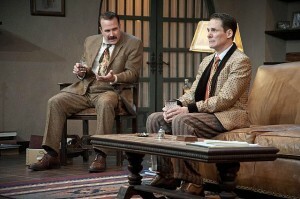 Photo by Scott Barrow, courtesy Barrington Stage Company. delineates the changing locations as the action unfolds. James Sugg designed the sound, and Raham also designed the costumes, achieving a completely authentic look for the characters. Chaim Potok’s beloved novel still has an important message for us, and that message is well-served by this production, excellent in every aspect. The Chosen runs through August 3. 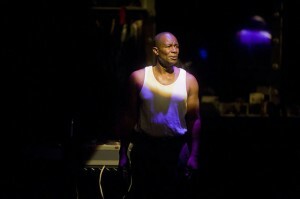 For tickets, visit www.barringtonstageco.org or call 413.236.8888. Ariel Bock as Madame von Meck. Photo by Enrico Spada. Jonathan Epstein as Tchaikovsky. Photo by Enrico Spada. 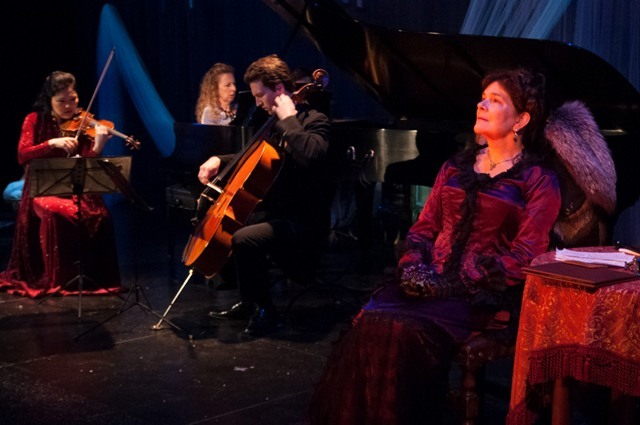 for the Romantic Century, which features two accomplished actors, Jonathan Epstein and Ariel Bock, joined on stage by three superb musicians as well as a tenor and a ballet dancer, which makes for an exceptionally rich and satisfying evening of music and drama. Susie Park, violin; Eve Wolf, piano; Adrian Daurov, cello; and Ariel Bock as Madame von Meck. Photo by Enrico Spada. 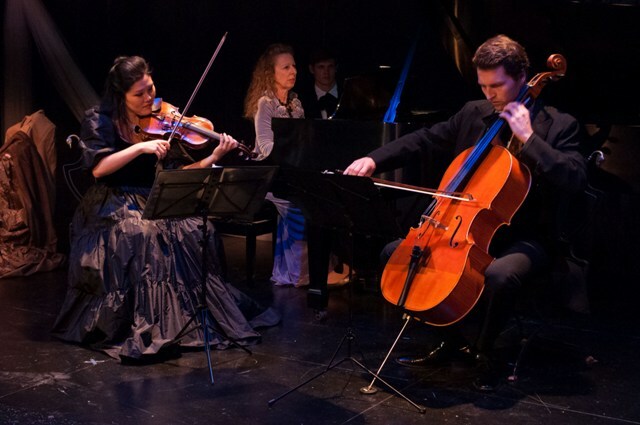 Daurov, the trio also performs Nocturne for cello and piano and Scherzo for violin and piano. The evening also includes tenor Edwin Vega singing some of Tchaikovsky’s moving songs. The musicians are excellent, and hearing Tchaikovsky’s passionate compositions in this very intimate theater is a special opportunity indeed. Edwin Vega, tenor; and Jonathan Epstein as Tchaikovsky. Photo by Enrico Spada. patron, supporting him financially for many years, and he was duly grateful. But the relationship was deeper than that, as they shared intimate thoughts and feelings as well as details of their lives in their frequent letters. This fascinating relationship is explored in None but the Lonely Heartby Jonathan Epstein and Ariel Bock, who deliver dialogue culled, for the most part, from the notes and letters of the two correspondents. Epstein is controlled, subtle, and charismatic as the somewhat reclusive composer, conflicted about his work and the homosexual tendencies he strove to conceal; Bock is warm and understanding as his confidante. They balance each other beautifully, embodying the two complex characters. These excellent performances are well worth seeing, especially when they are paired with the marvelous chamber music that is a part of this innovative production. Susie Park, violin; Eve Wolf, piano; Alec Donaldson; and Adrian Daurov, cello. 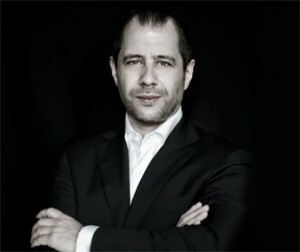 Photo by Enrico Spada. Director Daniel T. Sanders has done a masterful job of weaving all the elements of this unusual production together into a well-balanced, well-paced, and compelling evening. Even the inclusion of ballet dancer Daniel Mattei, whose elegant presence and beautifully realized choreography add much to the experience, is accomplished seamlessly. The sophisticated simplicity of the set and the sumptuous costumes by Vanessa James, and the fine lighting by Beverly Emmons, add visual depth to the overall excellence of the production. For tickets, please call the box office at (413) 637-3353 or visit www.Shakespeare.org. Joshua Bell, violin, and Rafael Fruhbeck de Burgos, conductor, with the Boston Symphony Orchestra. Photo by Hilary Scott. There was a marvelous display of musical pyrotechnics on stage at Tanglewood on Friday evening, July 5, when Joshua Bell and the Boston Symphony Orchestra performed an opening night all-Tchaikovsky program in the Koussevitzky Music Shed. Bell offered a dazzling performance of Tchaikovsky’s Violin Concerto in D with Rafael Fruhbeck de Burgos on the podium, who then led the orchestra in a powerful Symphony No. 5. It was a hot evening with an uncomfortably high dew point, but the Shed and lawn were packed with enthusiastic patrons; the orchestra was in shirtsleeves and Bell, performing at Tanglewood for the 25th consecutive season, performed in his signature black shirt and vest. 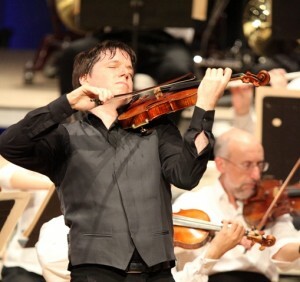 Joshua Bell, violin, performing with the Boston Symphony Orchestra. Photo by Hilary Scott. Joshua Bell’s performance was focused and compelling. He created lovely contrasts between delicate, melodic passages and the whirling-dervish-like passages of cascading notes, all with tremendous passion and energy. The concerto is an emotional piece, varied and lively. A notably difficult piece to play, Bell more than rose to the challenge, delivering a nuanced, beautifully calibrated performance, arcing from quiet, delicate moments to bold, commanding passages with the mastery of a mature performer. The music begins plaintively, but Tchaikovsky penned a rich, lush, Russian-inflected concerto, covering vast emotional ground. Bell was magnificent, dazzling the audience with confidence. He plays boldly and with power. The recurring motifs are achingly beautiful, however difficult the composer’s life was when he wrote this music. According to the program notes (always illuminating), Tchaikovsky was fleeing a disastrous marriage and grappling with depression and confusion in his private life when he composed the violin concerto, and he did not consider it a success. Artists and audiences think differently, and the piece is often performed. Tchaikovsky’s music is accessible, vastly entertaining, with a strong narrative sense. The second piece on the program, Tchaikovsky’s magnificent Symphony No. 5, doesn’t disappoint, and Fruhbeck de Burgos delivered a powerful performance – the orchestra was in fine form despite the sticky weather. 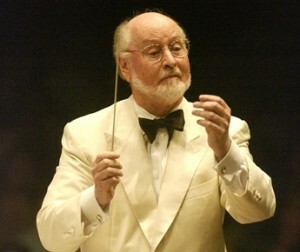 The conductor led the orchestra with passion, often leaping to his feet. All in all, the BSO’s opening performance of the 2013 Tanglewood season was superb and bodes well for the rest of the summer. For tickets and complete information about the Tanglewood season, visit www.tanglewood.org. single mother living and working in New York City. 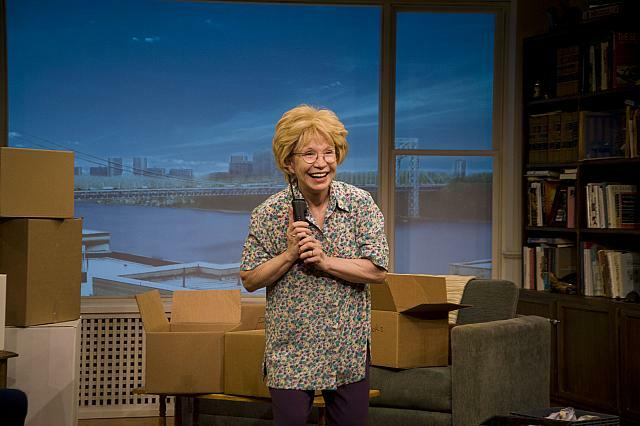 The story of her remarkable life unfolds in Mark St. Germain’s excellent new play, Dr. Ruth, All the Way, directed by Julianne Boyd, now playing at Barrington Stage Company. production. This is a sparkling gem of a one-woman show; the story flows beautifully for the almost two-hour-long running time. Every element works: St.
Germain’s brilliant writing is beautifully interpreted by Julianne Boyd’s skillful, insightful direction, to say nothing of Debra Jo Rupp’s superb performance. 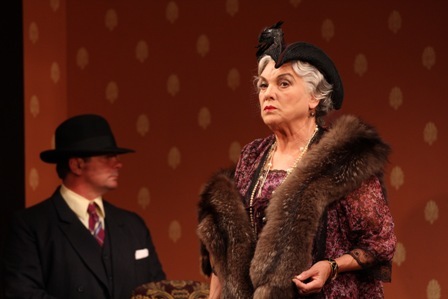 Lady Bracknell as a tough, pistol-packing mob matriarch? Played by the indomitable Tyne Daly? Absolutely. In directing Oscar Wilde’s The Importance of Being Earnest at Williamstown Theatre Festival, David Hyde Pierce, with a touch of inspired alchemy, has given the audience a new way to enjoy this marvelous society satire. Damon Ru nyon’s fictional New York gangsters, circa 1932, operated within a social hierarchy as clearly defined as that of Wilde’s fictional English upper class at the close of the Victorian era. So why not take The Importance of Being Earnest, Wilde’s brilliant comedy of manners, and imagine the characters are members of an American mob family, transplanted to London to escape some awkward “entanglements”? That is precisely what Hyde Pierce decided to do, with fascinating – and very, very funny — results. A sunny afternoon, the Boston Pops, and the extraordinary Bernadette Peters combined for a perfect Tanglewood afternoon. Sunday’s concert, the first Boston Pops performance of the 75th Tanglewood anniversary season, began with a varied musical salute to the city of New York, followed by a set of marvelous songs performed by the incomparable Peters (she included a generous selection of tunes by Stephen Sondheim), and finished with the Pops’ signature march, Sousa’s Stars and Stripes Together. The Boston Pops, conducted by Keith Lockhart, opened with John Williams’s Liberty Fanfare, composed in 1986 for the 100th anniversary of the Statue of Liberty. The bold piece showcases the brass section, features a big and varied percussion presence and also includes a lovely melodic section; it was a perfect start to the afternoon’s proceedings and the Pops Orchestra was in fine form. Keith Lockhart welcomed the audience and explained that the first half of the concert was a tribute to New York City: then he introduced the second selection, a terrific arrangement of 42nd Street, the tune from the film of the same name, with music by Harry Warren and a marvelous arrangement by Don Sebesky. The orchestration is huge, a brash celebration of the song, with a distinct swing/jazz flavor. There is a wonderful tuba solo, very engaging percussion, big sound from the brass, and a spectacular saxophone solo. This number was just a lot of fun. [Pittsfield, MA] — The taut, tense plot of Rajiv Joseph’s psychological thriller, The North Pool, is a fascinating one, full of surprising twists. The excellent production at Barrington Stage Company’s St. Germain Stage now through August 11 features a pair of powerful performances, with the two male characters, one a high school administrator and the other a student he has summoned for questioning, circling and stalking each other like modern-day gladiators, all in the space of one fraught hour of detention at a public high school. This production is skillfully directed by Giovanna Sardelli, who has orchestrated a remarkably authentic dialogue between her two actors as well as creating real suspense for the series of revelations that constitutes the plot. 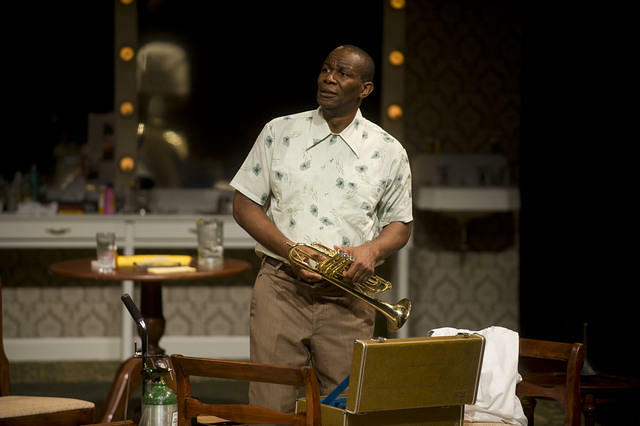 John Douglas Thompson delivers an extraordinary performance in Satchmo at the Waldorf, portraying three men: the aging Louis Armstrong, his bulldog of a manager Joe Glaser, and even the critical Miles Davis. 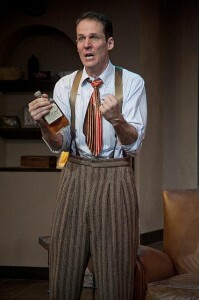 “I got stories on top of stories,” says Armstrong in Terry Teachout’s brilliant play, and it’s true – Armstrong’s story is utterly compelling and this excellent production, from the fine writing to Gordon Edelstein’s superb direction to Thompson’s bravura portrayal, serves Armstrong’s legacy well. Toward the end of his life, Louis Armstrong (called by many the greatest jazz musician of the twentieth century) recorded hundreds of hours of conversations and anecdotes. 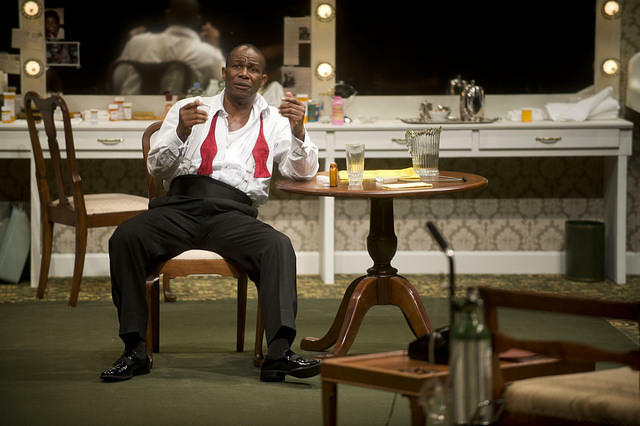 This play is set in Armstrong’s dressing room at the Waldorf Astoria in New York in 1971, shortly before his death, and the reel-to-reel tape recorder is prominently placed on the set, providing the framework for Armstrong to begin relating his life story. 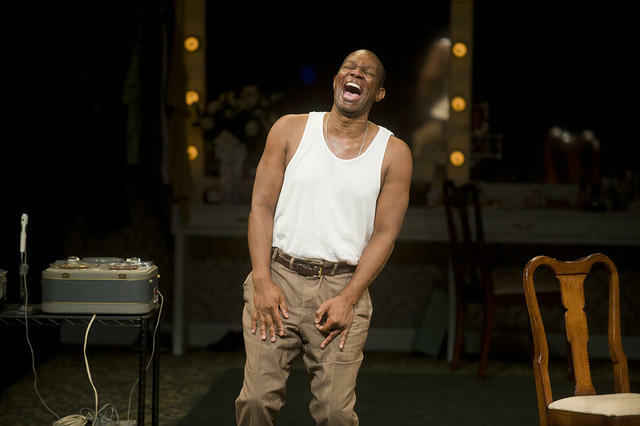 Teachout is an expert on Louis Armstrong, having written the biography Pops: A Life of Louis Armstrong in 2009, and while this play is a work of fiction, Teachout based it on Armstrong and Glaser’s lives. Satchmo offers a fascinating look at the music business in the first half of the twentieth century, told through the life experiences of this musical genius, from his impoverished childhood in New Orleans to his years on the road during Jim Crow to his success, which surely came at a price. We learn about his four wives, about traveling in the segregated South, about dealing with gangsters, and about Armstrong’s passion for his music. 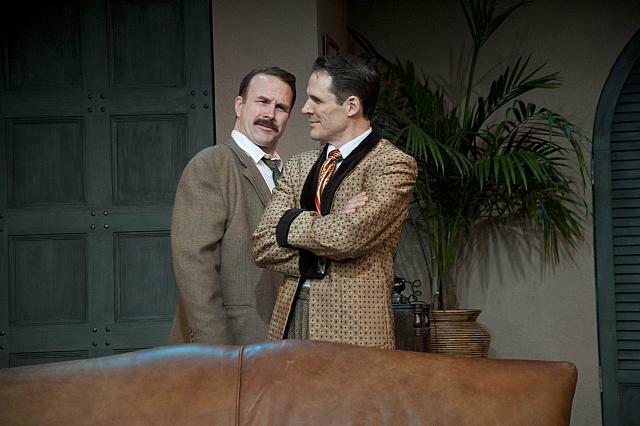 But this play is about a relationship, possibly the most important relationship in Armstrong’s life – the one he had for forty years with his manager, Joe Glaser. 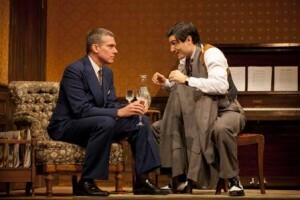 Thompson is a chameleon, shifting from Armstrong to Glaser and back again many times during the play – and it is always immediately clear which man is speaking. That Thompson plays bo th Armstrong and Glaser – one actor giving us both sides of the relationship – is amazing, and in one scene he has a telephone conversation between the two men, seamlessly, convincingly. This is extraordinary acting. 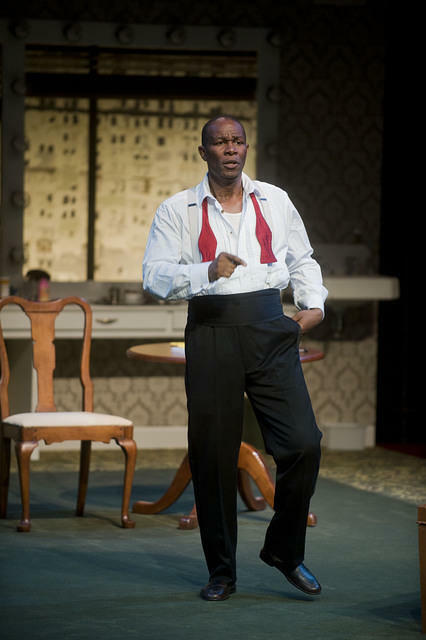 Armstrong’s public persona was that of an optimistic, charming, smiling entertainer, but this play reveals a darker, more complex character. The challenges of race relations during Armstrong’s lifetime surely shaped the public face that Armstrong showed to his public, especially the white audiences who came to his nightclub performances. And between the characters of Armstrong and Glaser, they explain the successful strategy behind the marketing, the branding if you will, of Louis Armstrong. Teachout’s play gives us glimpses of the familiar Armstrong who appeared on televi sion on mainstream programs like the Ed Sullivan Show, playing the accessible hits that made him wealthy, and he also shows us the Armstrong who used plenty of profanity, the womanizer, the angry Armstrong expressing his disgust over the travesty of segregation, and the dedicated musician who wondered why more black people didn’t come to hear his music. Thompson’s portrayal of Glaser is riveting as well – the Jewish entrepreneur who handled the finances, the negoti ations, and the packaging of the jazz star was a brash, hard-charging individual. Glaser made some hard decisions and in some ways tried to shield Armstrong in what was a tough business. The two men were very, very different, making Thompson’s performance all the more impressive. 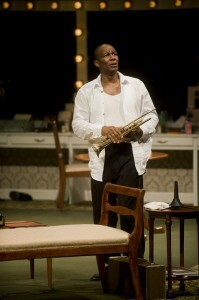 The third character appears in just a few vignettes: Thompson plays Miles Davis, who accused Armstrong of pandering to the white audiences and selling out musically. There are so many reasons to see this show – under the sure hand of Gordon Edelstein, the production is seamless. Edelstein is the artistic Director of the Long Wharf theatre in New Haven, Connecticut, and Satchmo will transfer there in the fall. Teachout has written a significant play, important in revealing the details of Armstrong’s story in this powerful way. But the main reason to make sure to see this exceptional show is to witness Thompson’s brilliant performance — it is an extraordinary artistic accomplishment. Satchmo at the Waldorf runs approximately 90 minutes without an intermission. Production team: Set design by Lee Savage; costume design by Ilona Somogyi; lighting design by Matthew Adelson; sound design by John Gromada; stage managers Diane Healy and Hope Rose Kelly. Satchmo at the Waldorf plays through September 16. For tickets call 413.637.3353 or visit www.shakespeare.org.